Chelsea Physic Garden is a hidden spot in the heart of London, quite the rarity! 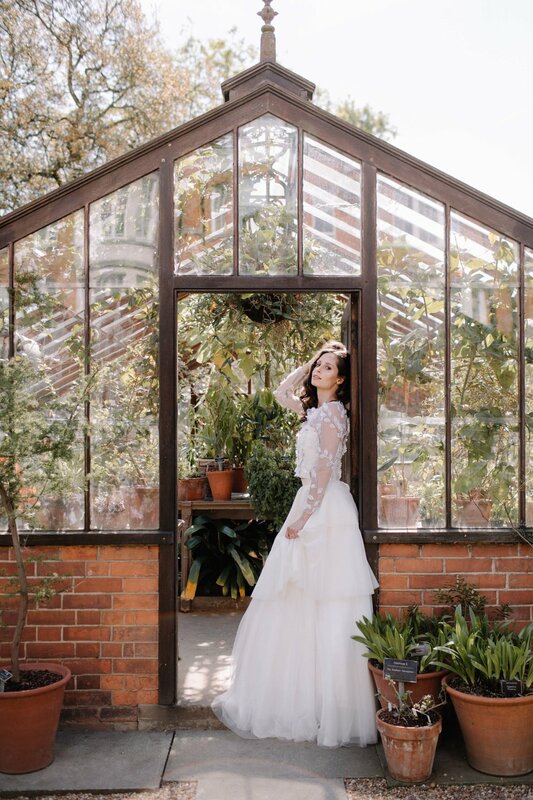 The talented Always Andri and Rebecca Goddard Photography have captured the venue in a way that gives you a glimpse into how your own wedding photographs might look. The Physic Garden oﬀers a verdant, tranquil and luxurious location that you and your guests will never forget. I’ve been wanting to do a modern outdoor shoot in the city for a while now. 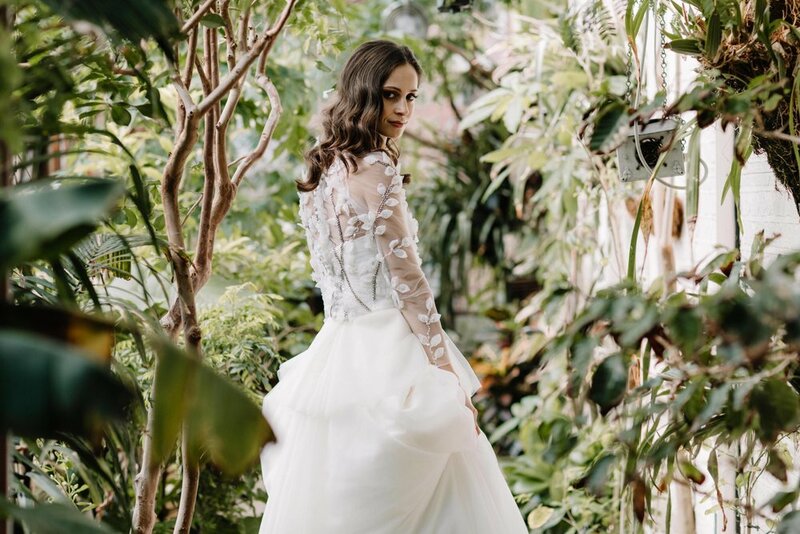 When Kate Edmondson approached me with her new dress designs inspired by nature and the outdoors I jumped at the chance to create a shoot around her designs. London is known for its cool modern vibe and fashion-forward brides. But where would a bride who wants a modern city wedding, and yet one that satisfies her love of the outdoors get married? Chelsea Physic Garden really is a hidden gem in the heart of London. Nestled behind a nondescript wall, a stone’s throw from the Thames River and the bustling shops of Sloane Square is an oasis of beauty and calm. It is the oldest botanical garden in London and houses around 5,000 different medical, herbal, edible and useful plants. 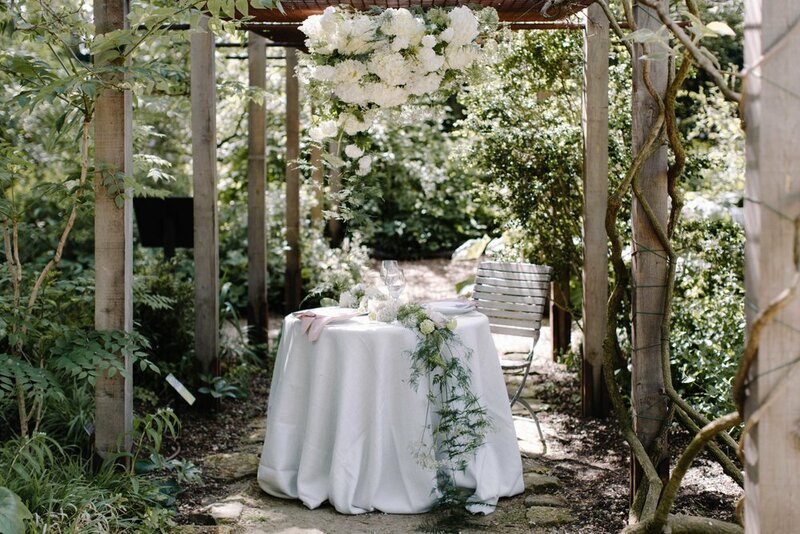 With four acres of open spaces and charming green houses that contain an array of beautiful plants, Chelsea Physic Garden is the perfect setting for an outdoor city wedding. We wanted the tablescape to blend into the gardens but still have a contemporary feel – with modern tableware and botanical inspired stationery by Nat’s Paper Studio, sitting under a cloud of fluffy white hydrangea by our florist Bloomologie. A rose adorned tree creates the perfect backdrop for a ceremony or that perfect statement backdrop for portraits. For the first look Kate created a 2-piece outfit with long sleeve top using textured floral tulle teamed with a three-tier tulle skirt. Hair by Love Hair By Lou was styled with elegant waves, and airbrush makeup by Ana Ospina was kept natural and glowing. For our second look we wanted to create a more dramatic evening look with an asymmetric foliage hair piece and bold red lip. The halter neck backless dress with built-in train had hand sewn appliqué lace flowers adorning both the bodice and edges of the train. Not only are the beautiful images inspiring, but the video gives a real feel for the outdoor atmosphere created.